The crew receives a call for help from Iris. On the cover, Mal's pistol has DS engraved on the side. This is not an actual feature of Mal's pistol, but the initials of the cover's painter, Dan Dos Santos. The inside front cover of this issue gives a brief rundown of recent events experienced by the crew of Serenity, notably from the Serenity movie and the Leaves on the Wind mini-series. On the double-page spread of pages 2-3, Zoe remarks on Jayne's habit of killing folks that don't always need killing. Jayne defends his actions, saying, "You talkin' about that time on Ithaca? I swear that banana looked a like a gun, Zoe. It was an honest mistake." This appears to reference an unseen adventure of the crew in the recent past. Ithaca is a planet in the Georgia system. On page 6, notice that Simon is wearing his Logan's Run sweatshirt (last seen in "The Message"). Jayne is wearing his Fighting Elves t-shirt (last seen in "Safe"). On page 7, Inara remarks on how her life has changed since she left House Madrassa. House Madrassa is a training school for Companions on the planet Sihnon. 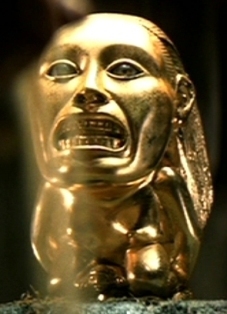 On page 9, the small statue on the shelf behind Inara looks like it might be the gold Chachapoyan fertility idol that Indiana Jones took from the ancient temple in the 1981 film Raiders of the Lost Ark! On page 15, Jayne is seen wearing the chullo cap sent to him by his mother in "The Message". He is also polishing Vera, his Callahan full-bore auto lock rifle. In this issue, the crew is reunited with Iris, who first appeared in the "Leaves on the Wind" mini-series, on Burnet. Burnet is a moon of Meridian in the Blue Sun system. On page 16, Serenity is setting down at Starfury Ship Depot on Burnet. Mal remarks to Iris that they left her and Bea on Theophrastus. This occurred at the end of "Leaves on the Wind" Part 6. On page 18, the Cortex information River finds indicates that Bea is wanted in suspicion of working with the Peacemakers, an anti-Alliance terrorist group. It was revealed that Zoe had some connection with them in the "Better Days" mini-series. 2-3/7 Mal says, "Mao re qi de fei wu dui." This is obviously Chinese, but I've been unable to translate it. 2-3/11 Jayne says, "Not getting paid enough for this fei hua..." Fei hua is Chinese for "Nonsense." 18/6 Zoe says, "Zhe gai si de dong xi shi shen me." I've been unable to translate the sentence.